Sky is adding a glut of new features to its Sky+ boxes that improve the experience Sky Movies customers expect from the service. Launching as part of Sky+'s third software update of 2015, the new features are geared towards presenting a Sky Movies experience that gives you, the user, more control and brings it closer to the on-demand features offered by the likes of Netflix and Amazon Instant Video. Users of other services will recognise the More Like This recommendation service hiding behind the yellow button that suggests content depending on the title you are currently watching. Given the size of Sky's catalogue at any one time, this will be an incredibly useful feature. Delving further into the update, there is now a Watchlist where you can save movies to watch at a later time and means you'll spend less time searching and more time watching during those cold winter months on the sofa. Missing the first 15 minutes of a film will soon be a thing of the past thanks to the Watch from Start tool that downloads a copy of any film to the Sky+ box every time you press the green button. That's not all as Sky has also teamed up with Rotten Tomatoes to add audience scores from the site as star ratings for every film and make it more simple to select the perfect movie to fit your mood. 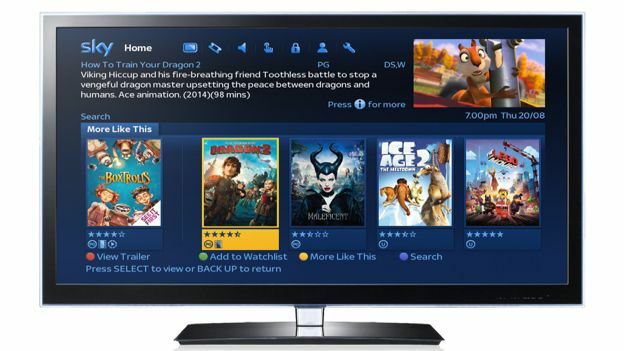 The features are exclusively available to Sky Movies customers with Sky+ or Sky+HD boxes and it's not clear whether Sky plans to add them to Sky Go or NOW TV at any point. Sky is now building Wi-Fi into Sky+ HD boxes. Hurrah!